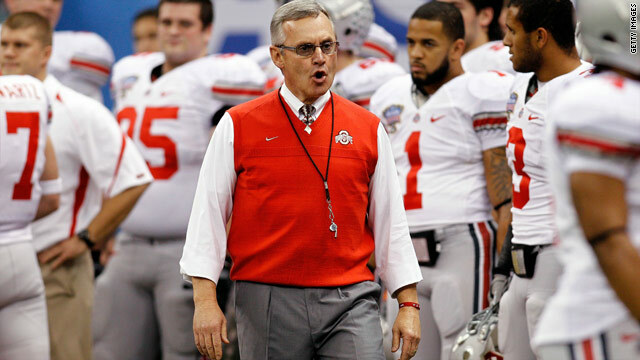 Ohio State coach Jim Tressel quit under pressure after lying to NCAA investigators about violations by his players. The Ohio State University announced Friday it is vacating all 12 of its victories from the 2010 football season and placing itself on two years' probation in the wake of a scandal that cost coach Jim Tressel his job. Tressel resigned under pressure after it was revealed he had lied to National Collegiate Athletic Association officials investigating allegations that Ohio State players had received special benefits from local businesses in Columbus, Ohio. Several players, including star quarterback Terrelle Pryor, allegedly swapped team and personal memorabilia and equipment for tattoos and other benefits. Tressel became aware of the transactions, which violate NCAA rules, but did not report them on a form all coaches are required to submit. Five players were suspended for the first five games of the upcoming season. "We are fully cooperating with the NCAA, and we look forward to working together to bring a resolution to these current matters," Athletics Director Gene Smith said in a written statement. The self-imposed sanctions are contained in the university's formal response to the NCAA's Notice of Allegations received April 21. The NCAA could impose its own punishment, which could be more severe. Tressel and the university also announced they had agreed to recharacterize his departure as a retirement rather than a resignation. "I take full responsibility for my mistakes that have led to the ongoing NCAA inquiry and to scrutiny and criticism of the football program," Tressel said in the university's press release. "I am grateful for this opportunity to retire from the university that I so deeply respect and that I will continue to support." If the NCAA investigated all the players at all the colleges, there would be no one left to play the game. I don't care who your college team is, the penalties for selling a couple of things for a tatto or getting a used car is absurd. These kids bring in millions of dollars to their prespective schools. Hey NCAA, lighten up! Couldn't agree more. Go Bucks!!! PeterStop the crap about the poor students. They know better...they can and should make good decisions. If not, they shouldn't be in college. This would actually be funny if it were not so true, especially about the part stating that they should not be in college. We all know that a great majority of them SHOULD NOT BE IN COLLEGE! They take them right out of the swamp and expect them to do college work? Please get serious and realize that most of them belong right where they were, nowhere! Who cares about these larcenous, lying and pampered athletes, who do not appreciate the cost (not to them) and value of an education? They were not helping their families. They were not interested in anything but tatoos and owning luxury cars. Once we honored scholar athletes. Now we don’t even have student athletes. Some still honor these thugs. Why? Vacating wins...ooh, scary. The thing is, I remember all of those wins. It really doesn't hurt the program at all to vacate them. Once the team has gotten their celebrations and parades, drilled the cheerleaders, and and had their fun, that's it. That's all the wins were ever good for. Vacating wins now means NOTHING. Vacating? What a load of crap! If OSU vacated all their victories from 2010, why does their own website still claim them as victories??? Here's the real story...Athletic Director Gene Smith, under pressure from the OSU Board of Trustees is doing whatever he can to mitigate financial damage to a CASH COW (buckeye football program and all of the revenue streams attached to it). Coach Tressel and the players (the 6 who violated rules and the others who broke no rules, but now have their OUTSTANDING season thrown away), are punished as Smith tries to pin the wrong-doing all on Tressel and the players. What a joke!!! Smith runs a lax athletic department with a lax compliance department. The university president Gordon Gee winks at Smith and Tressel and all of this creates a permissive atmosphere within which 19 year old kids acted like...well...19 year old kids. If the university is serious about cleaning up this mess, Gene Smith must be fired. Doug Archie (head of compliance) must be fired. Gordon Gee (university president) must be fired. The vacating of victories is nothing but a naked attempt to save their jobs...and to save lost revenue that would come with penalties such as a TV ban or bowl ban. Love the Buckeyes. Love Tressel. Love the players. Have no use for Smith, Archie, or Gee. What ever happened to the Death Penalty for consistant cheaters. Ohio State, USC, and all the rest of the professional teams which deserve it. I'm no fan of OSU (Go Blue!) but the whole vacating wins thing is stupid. I can understand if the players used steroids or were ex NFL players posing as college kids but to vacate wins because of something that had nothing to do with on field activities is stupid. suspending the players is fine, the coach got fired is fine. Now just issue a big fine to OSU cause obviously all that cash they got from those wins is still theirs. Those kids who did everything right are being punished the most. Forfeit all wins in 2010 season? Does this mean the Rich Rod is going to get his job back? Afterall, he has a win from OSU. There's a big difference between vacate and forfeit. Pryor was a cancer on that team. He's not pro material and never will be. Funny that he almost went to Michigan. If they are really taking this matter seriously, in conjunction with vacating its wins, will OSU return all the Sugar Bowl money to the bowl committee, reimburse the other conference schools for the resulting loss, and refund part if not all of the cost of last season's ticket prices to their hapless fans and supporters who were defrauded? This is about the coach lying to the NCAA too. Not just what the players did. College sports has become big business and needs to be treated accordingly. To pretend it's part of a college education is a ruse and everyone knows it. This is particularly true in the larger schools. Let's quite kidding ourselves and make the changes needed to treat it as a business and nothing more or less. DA NA NA NA NA – GOOOO GATORS! If you aint a gator, you are gator bait! That means you too Ohio State. Back-to-back-to-back chOmpionships!